Linamar is ranked 33rd among the Top 100 Automotive Suppliers in North America and 65th among the Top 100 Automotive Suppliers globally in terms of automotive parts sales. With current operations in North America, Europe and Asia and further expansion plans underway in China, Brazil and India, Linamar is well positioned to support the continuing OEM trend of global automotive platforms. Linamar has strong historical sales growth, a stable balance sheet and a willingness to invest in new capital and technologies. Keep informed of the latest news and developments by accessing the company's press releases, public filings, financial reports, corporate governance protocol and upcoming events contained within this section of the website. External resources on Linamar's financial performance can be found by contacting one of the following financial institutions and its corresponding equities analyst. The opinions and forecasts of third parties do not reflect those of Linamar Corporation or it's senior officers. Information obtained from these external sources is provided for investor awareness and convenience. It is not meant as an endorsement of their conclusions and recommendations. Linamar's corporate governance philosophy is to keep an even balance of Independent Directors and Non-Independent Directors. The Board takes several measures to facilitate the exercise of independent judgment including the annual review of the Code of Governance Practices and Charter of Expectations for Directors. These annual reviews ensure that the documents reflect best practices and are in compliance with applicable regulatory requirements. To learn more about Linamar's Corporate Governance policies and practices, please review the documents below. The core of Linamar's culture is an environment built on trust and integrity. The role of each Linamar stakeholder is to ensure that any ethical concerns are brought to the attention of the company. The role of Linamar is to listen and investigate these concerns. By having a transparent reporting process to communicate ethical concerns, the company can be confident it is upholding Linamar's values and codes of conduct. Every business is required, by law, to actively address reports of potential fraud, corruption, or unethical behaviour. Through commitments to the Ontario Securities Commission and the Linamar Audit Committee, and by requirement of the law, Linamar has partnered with NavexGlobal to utilize their EthicsPoint HelpLine. 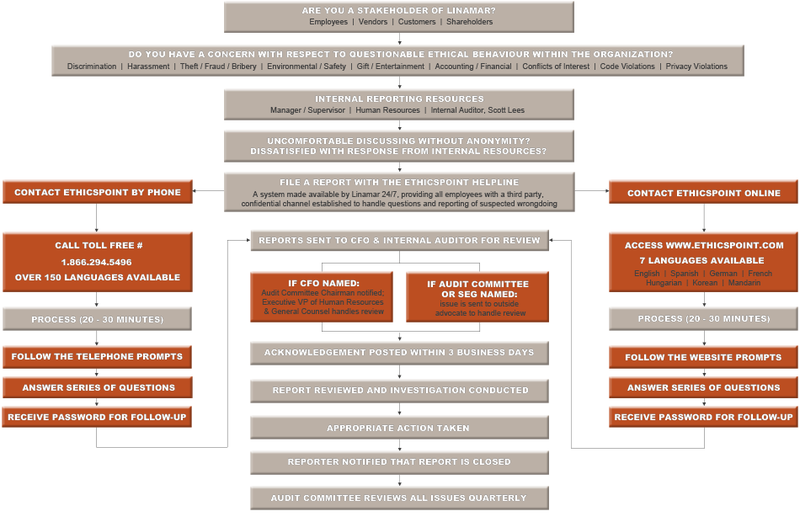 This third party reporting system provides stakeholders of Linamar with a way to confidentially ask questions or report concerns regarding the ethics of those acting on behalf of Linamar without the fear of retaliation.